And we too, as a nation, have partaken in the darkest of sins. Tomorrow is also a milestone of history. Tomorrow marks the fortieth anniversary of the day that America legalized the killing of its unborn children. Israel offered up thousands of its children. America has offered up millions. Fifty million souls are not here today. Fifty million people will not be here, watching or cheering at the inauguration. They're silent, for their lives were legislated out of existence, even from this city. And in order to hide the magnitude of our moral descent, we redefine words and change their meanings on this and other sins. And yet a thousand apostate ministers swearing on a thousand Bibles will not change a jot or tittle of God's word. Though silent, they cry out in bearing witness to the darkest of our sins. And God hears them. And as He spoke through the ancient prophets to Israel, so His words now echo down to us, "When you lift up your hands to be in prayer I will not listen. For your hands are covered with blood." The "city on a hill" has grown dark. Its lamp has grown dim. Its glory is fading. For God is not mocked. No nation can war against the very source of its blessings and expect those blessings to remain. And as it was with ancient Israel, the city on the hill now stands under the shadow of judgment. How does judgment come to a nation? After defying all of God's calls and warnings, the nation of Israel would experience something unprecedented. It was the opening stage of judgment. God removed one of Israel's blessings. Years before the nation's destruction, He allowed its hedge of protection to be lifted. He allowed an enemy to make a strike into the land. It was a wake-up call to avert national destruction. Nothing else would reach them. The strike was limited and temporary. The nation was now given a period of time to turn back to God or enter into judgment. This first opening biblical sign of national warning and judgment is this initial removal of the nation's hedge of protection. So it came to pass in America on September 11, 2001. It was on that day that we witnessed the nation's hedge of protection removed. An enemy was allowed to make a strike on the land. As with Israel, the strike was limited and temporary. It was a wake-up call. And for a short-time it looked as if America would wake up. It looked as if we were on the verge of a national revival. People flocked to churches and spoke of God. And then, a few weeks later, it was all over. There was no revival. There was no change of course. America continued down its course of spiritual departure from God, but did so now with even more fervor. Eleven years after 9/11, the nation stands not closer to God, but much farther away. The revelation of The Harbinger is this: There exists an ancient mystery that lies behind everything from 9/11 to the collapse of the American economy — a mystery so precise that it actually reveals the actions of American leaders before they take them, the exact words of American leaders, before they speak them, a mystery so exact that it gives the dates, even the hours of some of the most dramatic days in recent history. In the last days of ancient Israel, before its destruction, nine harbingers, nine prophetic signs of national judgment, appeared in the land. Those same nine harbingers are now reappearing on American soil. Some have appeared in New York City. Some have appeared in Washington, D.C. Some have involved the highest leaders of the land, even the president of the United States and they touch every realm, the political, the economic, the cultural, the spiritual, and affect every American and every American's future. The harbingers are revealed through an ancient Scripture, the vow that Israel made after that first strike of warning. It appears as Isaiah 9:10. Instead of repentance, they responded to the warning with defiance. They said this: "The bricks have fallen. BUT we will rebuild with hewn stone. The sycamores have been cut down, BUT we will plant cedars in their place." What they were saying was this: "God, you won't humble us, you won't cause us to return. We will continue on our course. We will continue to abandon your ways. We will defy you and even more than before. By our own efforts, we will rebuild and come back stronger than before." 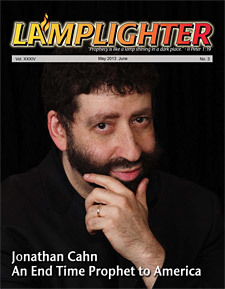 In the fourth and last segment of Jonathan Cahn's speech he made at the Presidential Inaugural Prayer Breakfast, he will reveal what America's only hope is.